Elite Fine Jewelry is now open at 2480 Sacramento Street, near Fillmore. A dream of a new jewelry store is now open in the neighborhood. But it began as a nightmare. Jeweler Simon Khurin and his family lived only 80 miles from Chernobyl when the Russian nuclear reactor imploded in 1986, spewing radiation across the landscape and forcing the relocation of all who lived in the area. “I thought after one year the radiation would be over and we could come back,” he says. But when it became clear it would be decades, at least, before he could go home again, he made the decision to move his wife, his child and his parents to the United States and start over. They had friends in San Francisco, so they came here. Khurin had little money and spoke even less English, so he worked as a laborer as he sought ways to rebuild his career as a jeweler. He rented a small space on a desolate stretch of Fillmore Street in the mid-1990s, long before new life stirred in the jazz district, eventually moving up to a spot on Fillmore near Post, where he opened Elite Jewelry. It lasted a few years, but then his storefront and several others were consolidated to create an expansive new home for Goodwill. His talent and drive had become evident, however, and with a partner he had established a growing jewelry design and manufacturing business in San Carlos. Still, he had fallen in love with the neighborhood, and he was determined to have his own jewelry store here. One day he saw a “for sale” sign on a pint-sized building on Sacramento Street, just around the corner from Fillmore. “I thought, ‘Yes!’” and with a partner found a way to buy it, becoming the landlord of the Toujours lingerie shop and Soaps hair salon, plus a residential unit upstairs. Finally, last year, he decided to take the plunge and open the jewelry store of his dreams. “I was ready,” he says. And in early May, Elite Fine Jewelry opened its doors at 2480 Sacramento. The custom showcases made of a forest of lacquered birds-eye maple gleam with gold and platinum and jewels of all kinds, cuts and colors. There’s a shimmering pair of emerald tear-drop earrings. “It’s one,” he says. “We just made one pair.” And yellow diamonds, and a matching antique yellow topaz brooch and pendant. Most unusual is a natural amber necklace, still rough and looking as if it was just separated from the earth. 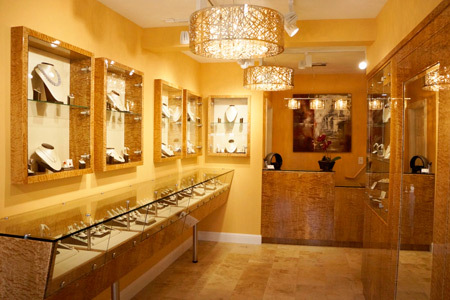 Elite Fine Jewelry offers a full range of jewelry repair and design, plus watchmaking services and repairs.